A sad day for this historic franchise. 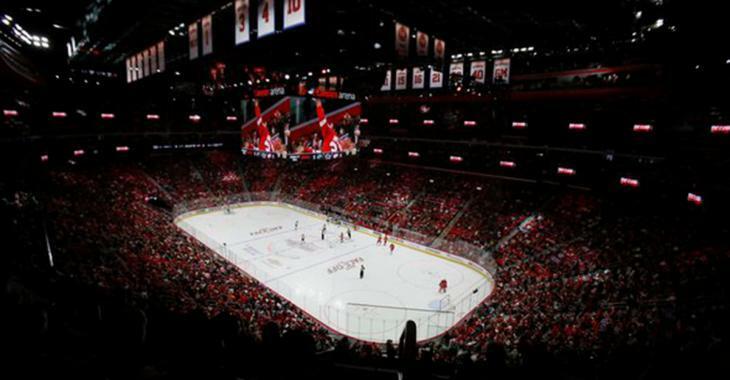 According to a report from Detroit Red Wings blog Wings Nation, team president Chris Granger has announced that the historic and iconic red seats that are so synonymous with Red Wings television broadcasts will be replaced with black seats at Little Caesar’s Arena. Why? Well evidently those red seats are a little too iconic… especially when no one is sitting in them. If you’ve watched a Red Wings home game at any point during the past six months or so you’ll likely have noticed the red wall of empty seats on your television screen. This is obviously not a good look for the historic franchise, especially given that the team moved into the brand new building just 13 months ago. The red seats stick out like a sore thumb when there’s no one in them, a decidedly bad look on television screens. Ouch… again NOT a good look. In the meantime, the organization has installed temporary black seat covers to help curb the embarrassment during live broadcasts. The red seats, as seen by the number of fans that bought them, were precious to the atmosphere at the Joe Louis Arena. To carry over that tradition to the LCA was significant to make this a new home for the Red Wings – now that they’re gone for the sole purpose of not being embarrassed, a little part of Red Wings legacy has gone with them. The whole organization should be ashamed. Sad times in Hockeytown. Sad times indeed.